Be Seen, Get Screened's Physician Spotlight Q&A series highlights the work of health care professionals on the front line in the fight against colon cancer. In our latest Q&A, we talked to Katrina Roop, D.O., a family practice physician at the USMD Fort Worth – Alliance Clinic. Be Seen, Get Screened: Tell us a bit about your professional experience, specifically in regard to colon cancer and colon cancer screening. Does your position as a family practice physician provide any unique challenges or opportunities in caring for your patients? As a primary care physician, I believe the most important part of my job is to prevent disease and promote health. After much research, guidelines have been put forth for routine screening exams that help us identify early signs of disease prior to the onset of symptoms. In my practice, I have conversations about colon cancer screening on a daily basis. 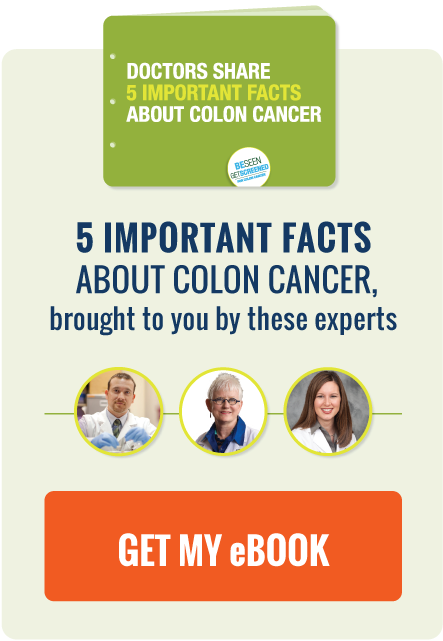 I find many of my patients have misconceptions about colon cancer and colon cancer screening. It is so important for people to understand that colon cancer can be a preventable condition. The most reliable test for colon cancer screening is the colonoscopy, and in most cases, is recommended at age 50. The benefit of the colonoscopy is it allows the gastroenterologist direct visualization of the colon lining. During this procedure, when a polyp is found, it can be safely removed, preventing cancer. BSGS: Do you encourage family members to talk with each other about staying up-to-date with screenings? Absolutely, it is very important to be aware of family history, as this can determine the age colon cancer screening should begin or how frequently the testing should be performed. Also, family members who have undergone screening can help encourage other family members to do the same. BSGS: What are some common objections to colon cancer screening? How do you address them? What do you say to patients that are hesitant to get screened for colon cancer? It is estimated that only 1 in every 3 people have the appropriate colon cancer screening. Often, people are fearful of the procedure, the cost of the colonoscopy, and also the preparation the day before the testing. I always start by telling patients what to expect during each part of the process. Cost, while it is generally covered well by most insurance companies, can still be prohibitive. While colonoscopy is the test of choice, there are other options for colon cancer screening. Stool testing, including testing for blood or newer DNA testing, can be performed. These tests are a non-invasive, less expensive way to test, but may not be as reliable. CT colonography (a CT image of the colon) is not covered by some insurance plans, and still requires a prep of the colon by use of a laxative. A sigmoidoscopy is similar to a colonoscopy, but only the most distal portion of the colon is visualized, leaving the remaining portions of the colon unexamined. These are all options, but colonoscopy remains the gold standard for colon cancer screening. BSGS: Who is most at risk for developing colon cancer? Besides screening, what can patients do to lower their cancer risk? It is estimated that 90% of colorectal cancer occurs in those over the age of 50. While that is the case, there are some conditions that predispose younger individuals to colon cancer, including inflammatory bowel diseases, genetic conditions that cause numerous polyps to develop in the colon, and also having a family history of polyps or colon cancer. Research also suggests that diets low in fiber and high in fats can contribute to the risk of developing colon cancer, as well as smoking, obesity, sedentary lifestyle, and consuming excessive alcohol. While colon cancer screening is the most important step one can take in the prevention colon cancer, there are simple lifestyle changes that may help to lower the risk and improve overall health.